Fig 1: Bedaquiline marketed as Sirturo. Recently, I attended a talk on tuberculosis by Soumya Swaminathan who covered a great in depth detail on current scenario of tuberculosis. During the talk, it just occurred to me that bedaquiline and delamanid has been already approved for use in many different countries. Considering that the experiments published for assessment of the drug target had mutations, it was kind of striking to me think that bedaquiline resistance is already there. Though I have read some reports here and there, I never gave this whole idea a detailed look. 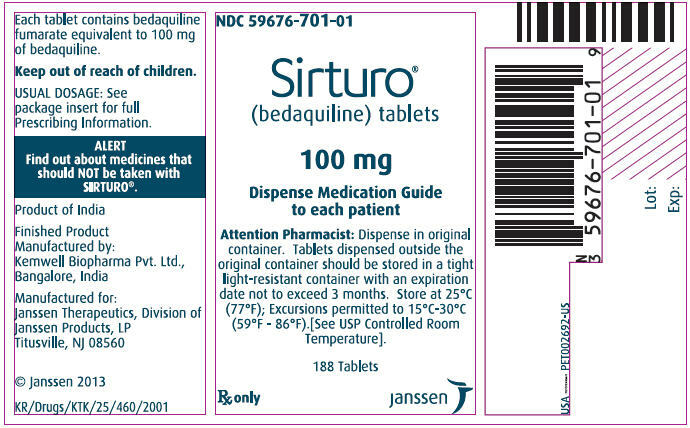 Bedaquiline is a new generation anti TB drug markerted by the trade name of Sirturo. Bedaquiline works by blocking an enzyme inside the Mycobacterium tuberculosis bacteria called ATP synthase. The specific loss of ATP synthase activity basically kills the bacteria. A detailed pharmocological profile and other related details can be found here. In an article published in NEJM by Bloemberg etal;2015 a case of is recorded where the patient showed up with TB and repeatedly acquired resistance to multiple antibiotics including bedaquiline and delamanid. As the resistance developed, the genome was sequenced which showed mutation in mmpR that was associated with bedaquiline resistance. Subsequently when Delamanid was started mutations in fbiA and fgd1 developed asssocaited with resistance to delamanid. Several reports are published where bedaquiline resistant strain have been sequenced and genes associated with resistance that were found include upregulation of MmpL5 (multisubstrate efflux pump), AtpE gene mutations and pepQ mutation. Interestingly, many mutations that effect bedaquline resistance also gives a cross resistance to Clofazimine. Bedaquiline-resistant mutants arise at a rate of 1 in 108. Delamanid is a drug that has come after bedaquiline, but there are now reports of resistance for that too. Currently, bedaquline and delamanid are on the final frontiers of treating XDR TB cases. It must be noted that the Bedaquiline and Delamanid are not yet fully available in all countries and most places these are used as testing drug. But popping up of resistance already is an indication that once widely available resistance is going to be really common. Some countries including India, have made it mandate that these drugs are not available over the counter and can be obtained only in governemnt supported RNTCP clinics. This greatly reduces the risk since these drugs are given only in very specific conditions. Considering the rising number of resistance in TB to first line drugs am sure that we are looking into a future where TB is mostly treated with second or third line of anti-TB drugs. That means, there is a desperate requirement for anti TB drugs. Sutezolid, an oxazolidinone is one such candidate currently in development as a treatment for extensively drug-resistant tuberculosis. TBA-354 (A Nitroimidazole derivative) is another drug for which there is great hopes vested. There is also some research happening in the field of mycobacteriophages, but its clinical application is on a very long way. 1. Andries K, Villellas C, Coeck N, Thys K, Gevers T, Vranckx L et al. Acquired Resistance of Mycobacterium tuberculosis to Bedaquiline. PLoS ONE. 2014;9(7):e102135. 2. Acquired Resistance to Bedaquiline and Delamanid in Therapy for Tuberculosis. New England Journal of Medicine. 2015;373(25):e29-e29. 3. Hatfull G. Mycobacteriophages: Windows into Tuberculosis. PLoS Pathogens. 2014;10(3):e1003953.